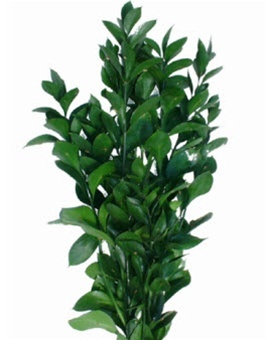 Israeli Ruscus is one of the most popular decorative greens in the floral industry. Israeli Ruscus has relatively narrow stems with elongated green leaves that extend from each branch. Each stem usually stands in excess of 24 inches. Ruscus comes in a grower's bunch of 7-10 stems. Free Shipping! If you care properly for your Wholesale Israeli Ruscus, they should last at least a week in the vase. Israeli Ruscus is one of the most popular decorative greens in the floral industry. You'll find it in bouquets of wholesale flowers and as a filler in wedding flower arrangements, table centerpieces and other uses. Israeli Ruscus has relatively narrow stems with elongated green leaves that extend from each branch. Each stem usually stands in excess of 24 inches. 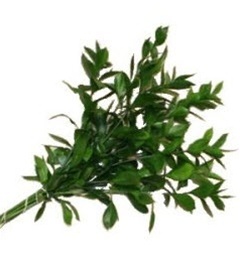 Ruscus comes in a grower's bunch of 7-10 stems. Israeli Ruscus is available year-round with the exception of a few gaps in production in the spring. It can become scarce in May and June during which time the plant blooms and the leaves can yellow. Each package is carefully packed and shipped to your door with FREE shipping!